Ack! 'Round 7pm or so... I was browsing the shelves and saw you on the other side. I swear I glimpsed our entire future together in that brief moment. It was beautiful. And then someone asked you for the time. I mean c'mon, who doesn't have a damn time-telling device of some sort these days! Oh, if only I'd thought of that. So dreamy. I love that you have mapped out their life together in the images on the book case. it's absolutely gorgeous and I have to admit the words are equally beautiful. If life was so . . .
Lovely. Time stopped while I was here. I always love your illustrations, but I think this is my favorite written missed connection yet. Thanks! This is amazing! Between the text and the illustration. So lovely. Definitely my new favorite. Beautiful! 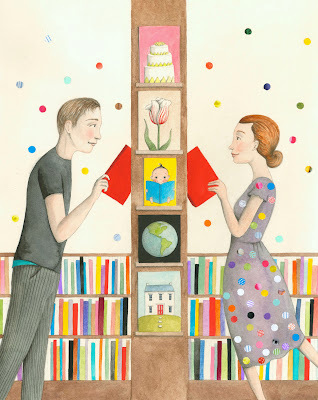 This illustration fills my heart with joy! The colors, shapes, couldn't be prettier than this! And it has a sweet and delicate romantic feeling... You are one of my favorite artists! fantastic! your paintings are able to show the wonder in life! I wasn't sure where to share this with you, but I found it sweet/funny/odd, and thought even if you didn't draw it, you might enjoy it! Love it :) I have three of your prints and have to control myself in order to not buy more! Amazing colors and so whimsical! as a librarian with a newly resurfaced romance from the past...it touches me. Thank you! haha sounds like a drama plot in a movie, i wonder if this really happen to someone or meet someone in a very unusual way, in any case i I like to meet people but not live close to them for long. awww!! this is so cute!